Today, Wednesday, September 1, 2010, the Feast of Saint Giles, is the one hundredth anniversary of The Oath Against Modernism, which was issued by Pope Saint Pius X to be taken by all members of the clergy (subdeacons, deacons, priests, bishops), pastors, confessors, preachers, religious superiors, and professors in schools of philosophy and theologates. This Oath, which was taken by Joseph Ratzinger when he was a seminarian and during his years as a professor of theology in various German universities from 1958 (Freising, Bonn, Munster) until the time that the Oath was "abolished" by Giovanni Montini/Paul VI's "Congregation for the Doctrine of the Faith in 1967, is a compendium of the various condemnations of Modernism, the synthesis of all heresies, that had been issued by Pope Saint Pius X from July 1, 1907, to the time of the Oath's issuance one hundred years ago today. Pope Saint Pius X condemned Modernist propositions throughout his pontificate. Paragraph Three of Vehementer Nos, February 11, 1906, that has been quoted on this site so frequently, condemned the separation of Church and State as a thesis "absolutely false." The Sillon, a precursor of conciliarism's contention that it is possible to build the "better" world in an "interdenominational" way rather than insisting upon Catholicism as the one and only foundation of personal and social order, was condemned by Pope Saint Pius X in Notre Charge Apostolique, which was issued on August 15, 1910, just seventeen days before The Oath Against Modernism. 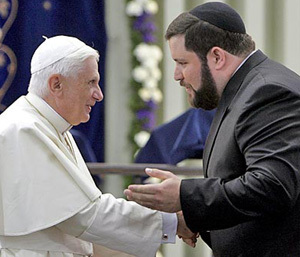 And quite in contrast to the view taken by the conciliar "popes," including Joseph Ratzinger/Benedict XVI, Pope Saint Pius X rejected the validity of Talmudic Judaism, explaining this in no uncertain terms to the founder of international Zionism, Theodore Herzl, on the Feast of the Conversion of Saint Paul, January 25, 1904. That's right. There cannot be true peace in the world unless everyone in it is of one one fold, that of the Catholic Church, and one shepherd, a true and legitimate Successor of Saint Peter, a qualification, it should be noted, that Pope Pius XI, mentioned very explicitly in Mortalium Animos. Joseph Ratzinger/Benedict XVI does not believe this at all. 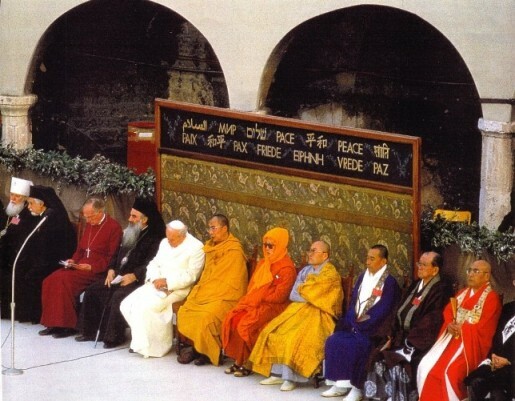 He believes that peace consists in the "coexistence" of religions with each other (see RELIGIONS ARE A FORCE FOR PEACE AND RECONCILIATION for just one such statement on the part of the false "pontiff." It should also be noted here that none of the men who have served as caesars here in the United States of America believe that Catholicism is the necessary precondition for a just social order at home and for peace in the world, a subject will be explored in the original article that will be published two days from now (in addition a republished article on the life and work of Pope Saint Pius X). 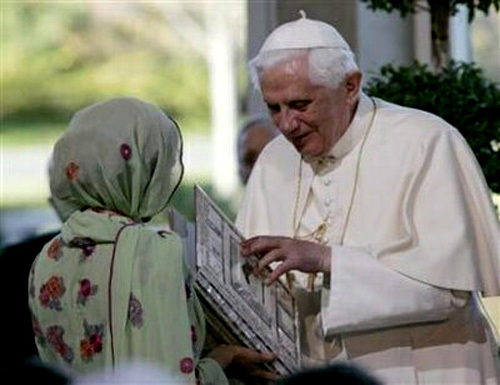 Giving the impression that the "pope" is just one among "equals." Assisi, Italy, October 27, 1986. This image insults the martyrdom of countless millions of Catholics who preferred death rather than even to give the appearance of such syncretism and practical religious indifferentism. At the synagogue in Cologne, Germany, August 19, 2005. 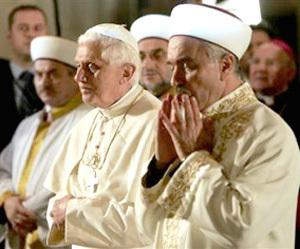 Ratzinger/Benedict the Blue Mosque, November 30, 2006. Fourthly, I sincerely hold that the doctrine of faith was handed down to us from the apostles through the orthodox Fathers in exactly the same meaning and always in the same purport. Therefore, I entirely reject the heretical' misrepresentation that dogmas evolve and change from one meaning to another different from the one which the Church held previously. I also condemn every error according to which, in place of the divine deposit which has been given to the spouse of Christ to be carefully guarded by her, there is put a philosophical figment or product of a human conscience that has gradually been developed by human effort and will continue to develop indefinitely. Furthermore, with due reverence, I submit and adhere with my whole heart to the condemnations, declarations, and all the prescripts contained in the encyclical Pascendi and in the decree Lamentabili, especially those concerning what is known as the history of dogmas. I also reject the error of those who say that the faith held by the Church can contradict history, and that Catholic dogmas, in the sense in which they are now understood, are irreconcilable with a more realistic view of the origins of the Christian religion. May God help us to keep this oath until death. Pray for the Restoration to come. Let us pray to Pope Saint Pius X every day for this Restoration, which will be the fruit of the Triumph of the Immaculate Heart of Mary, asking Our Lady to send us all of the graces that we need to stand firm in defense of the immutable truths of the Holy Faith without making any compromises with conciliarism in the slightest. To this end, of course, we must redouble the fervor with which we pray Our Lady's Most Holy Rosary on a daily basis, pledging ourselves daily to serve her Divine Son, Christ the King, through her own Sorrowful and Immaculate Heart.